Success! Ajira from Tanzania raised $609 to fund surgery to help her breathe. Ajira's treatment was fully funded on December 1, 2018. Ajira underwent surgery to help her breathe. Ajira’s surgery went well. Her enlarged adenoids were successfully removed. Ajira is a young student from Tanzania. She is the first born in a family of two children. Her best subject is art, and she loves drawing and painting. 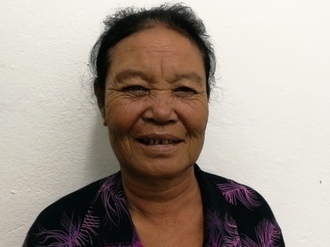 For two years, Ajira has been experiencing difficulty breathing and sleeping. She was recently diagnosed with enlarged adenoids, which are the soft tissue behind the nasal cavity. Without treatment, this condition will cause Ajira’s symptoms to persist and possibly even intensify. Our medical partner, African Mission Healthcare Foundation, is requesting $609 to fund an adenoidectomy for Ajira, which is scheduled to take place on October 19. Surgeons will remove her adenoids, hopefully relieving Ajira of her symptoms and helping her live more comfortably. Ajira's case was submitted by Joan Kadagaya at African Mission Healthcare Foundation in Tanzania. Ajira was submitted by Joan Kadagaya, Curative Medical Support Program-Partner Representative at African Mission Healthcare Foundation, our medical partner in Tanzania. Ajira received treatment at Arusha Lutheran Medical Centre (ALMC). Medical partners often provide care to patients accepted by Watsi before those patients are fully funded, operating under the guarantee that the cost of care will be paid for by donors. Ajira's profile was published to start raising funds. Ajira's treatment was successful. Read the update. Ajira's treatment was fully funded. Infected adenoids may become enlarged or chronically infected. This condition can subsequently lead to obstructed breathing, snoring or sleep apnea, frequent sinus or ear infections, sore throat, difficulty swallowing, and habitual mouth breathing. Patients will often experience frequent infections and obstructed breathing. An adenoidectomy is one of the most common procedures performed worldwide, and it is not specific to our medical partner's region. Patients are generally in the hospital for about five days after surgery. They are discharged if there are no signs of swelling or infection. After surgery, most children have fewer and milder throat infections and fewer ear infections. They also breathe more easily through the nose. An adenoidectomy is an operation with a long history of excellent results. It is usually performed with a tonsillectomy. In other words, both the adenoids and the tonsils are removed together. There are few quality hospitals in our medical partner's region with the expertise and resources to perform this procedure. Infection of the adenoids can be treated with antibiotics. An adenoidectomy is required if the patient has frequent infections or ongoing breathing problems, and antibiotics do not help.